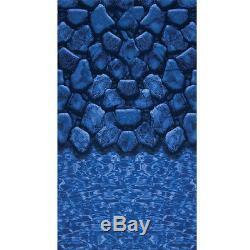 15'x30'x48 Oval Boulder Swirl Beaded Pool Liner-20 Mil. At SPP , our Aboveground Pool Liners are made from the finest 100% virgin vinyl, and will stand up to years of wear & weather. Beaded Pool liners have a thick-formed extrusion that hooks into a female receptor along the top of the pool wall. We stock many standard/hung beaded liners in the most popular sizes. Features of our SPP liner. Will not work in expandable swimming pools. Don't see your size liner, Give SPP a call! Standard 20 mil Above Ground Vinyl Material. Once the liner has been taken out of the box, the liner is not returnable. Hand folded flat, to reduce wrinkles unlike automated packers that twist and force the liner into the box which can cause permanent creasing. How To Measure For A Liner In Your Aboveground Pool. Measuring your pool for a new liner is a simple process. There are generally a few things we need to know so the correct liner can be delivered to you. On a Round pool you simply get a measuring tape and take 2 measurements. Go from inside the pool at the bottom of the wall and measure directly across to the other side at the same height. Do this in two locations in the pool so you get the same measurement. We like to measure at the bottom of the wall in case the wall is not plumb from side to side. The wall at the bottom track location is your safest bet. On an Oval pool you do the same thing as a round except that you do it in the middle of the pool from side to side and at the ends at the longest point from end to end. All measurements are from inside the pool touching the wall at the base. On Rectangular pools like a Kayak® you measure from side to side and end to end in the middle location of the corresponding rectangle. In rectangular pools we also need to know the corner shape. Is it square 90-degree corners, radius (rounded) corners, or diagonal (45 degree) angle corners? We need to know the measurement of the radius and the diagonal to better fit your liner. Depth of the pool can range from 36" to 54" deep. If your pool has water in it measure out at least 2 ft. From the sidewall with a measuring tape to the point at the top of the wall or where the liner is attached. Bear in mind that most round liners are made to be flat bottom and not a deeper middle. If your pool has a deeper area please contact one of our representatives to discuss. Some liners are what we call overlap. This type is the most common and simply folds over the corrugated metal wall and drapes down on the outside of the wall. The liner is held in place by plastic coping strips. You may wish to replace these if your old ones are brittle and dry. Beaded liners have a thick-formed extrusion at the top that hooks into a female receptor around the top of the pool wall on the waterside. Some brands of pools use a special bead that we can make for you as a special. Most pools can utilize the standard bead that is common in the industry. Better to be safe than sorry. Incidentally, you can change your overlap liner to accept a beaded liner by simply adding bead receiver strips to the order. This way, if you need to change the liner in the future, you do not have to remove the top seats of the pool. This is a real timesaver and is much easier to reinstall. J-Hook-V-Bead are liner types that have a thicker open flap top that inserts over the corrugated metal wall. It looks likes the plastic coping we use to hold an overlap liner over the metal wall except that, in this case, it is attached to the top of the liner. Customers who have shopped with us before can tell you - Specialty Pool Products offers the finest, most innovative and most effective items for your pool, spa, backyard and home. We only sell products that meet our strict standards for quality, function and value. If you are in need of immediate assistance please call, our reps are available during the hours shown above on our banner. We hold ourselves to the highest standards and value the trust you place in us. We pledge not to share this information with other organizations for commercial purposes. Specialty Pool Products does not rent or sell its customer list. The item "15'x30'x48 Oval Beaded BOULDER SWIRL Above Ground Swimming Pool Liner 20 Mil" is in sale since Wednesday, June 24, 2015. This item is in the category "Home & Garden\Yard, Garden & Outdoor Living\Pools & Spas\Pool Equipment & Parts\Pool Liners".com" and is located in United States. This item can be shipped to United States.